We are at the start of our second year with new teen theater program, The Warehouse Ensemble. We’ve decided to perform part 2 of the HOPE HIGH Series. The new script promises more depth and discovery of the characters and new problems for them to tackle. Uncle Kang needs to figure out how he will pass code inspection, Taco wants to patch things up, Jessica and Hope find work in an unlikely place, Jaqi can’t seem to get a break, Patti and Motha Earth have it out, Wisdom is still dazed and confused, Roxanne dances her way to a new place, Jeffery is now a Wombat, D-Roc and Sylvia move forward, and Auntie Sweet and Ma spread the love. Exciting times for the cast as we dig into some fun new stuff! We anticipate performing at Long Wharf again this year. Stay tuned for news on the Warehouse! 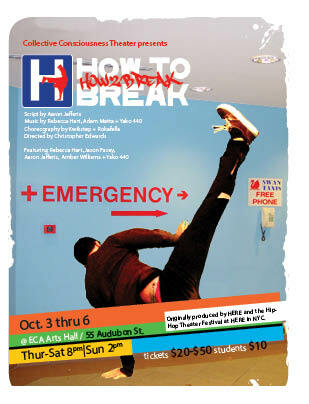 “How To Break” opens in just one week! Collective Consciousness Theatre’s biggest production yet opens in just one week. You won’t want to miss this gem written by New Haven’s own Aaron Jafferis. As part of the Arts for Healing Festival,October 2-6, this show is one of many events taking place next week around the subjects of health, healing and happiness. Aaron Jafferis was a guest speaker for the Warehose Ensemble this past winter and shared with us wonderful tips and ideas on performing and stage presence. Get your tickets now! $20 adults, $10 students (including highschool), $50 VIP. Collective Consciousness Theatre’s production of “How to Break” is on sale now! Get your tickets for the hottest show in New Haven this October! Playing Oct. 3-6at ECA Arts Hall, 55 Audubon St. Some of the fun moments were receiving note cards from audience members. People shared their honest feedback which was mostly positive. So many were surprised to discover that most of the cast had little to no previous theater experience. The DVD, filmed and edited by Bill Elias of WE Video did a great job (please email us if you’d like to purchase a copy $12 ea.). Pat Boozer and her crew took care of the front making sure we had snacks, souvenirs, and DVD available for the audience to purchase. The Long Wharf team made the magic happen. I personally couldn’t ask for a better team, cast, and theater to be a part of. I couldn’t ask for a better group of people to share my vision for this play with. GO BEAVERS! Agape Cogswell, Alex Rivera, Allen Thomas Jr., Alix Gouborn, Ali Robbins, Angelica Rodriguez, Anastasia Marinatos, Bianca James, Brigitte Cogswell, Que Payne, Richard Cogswell, Destiny Cogswell, Danka Henriquez, Chinequa Bailey, Diamond Jackson, JaQuann Brantley, Julio Patron, Luis Rivera, Madelyn Wright, Nielsen Filipe, Shannon Mykins, Chris Franci, Chelsea Gonzalez, Tianna Glass, and Rafael Ramos! 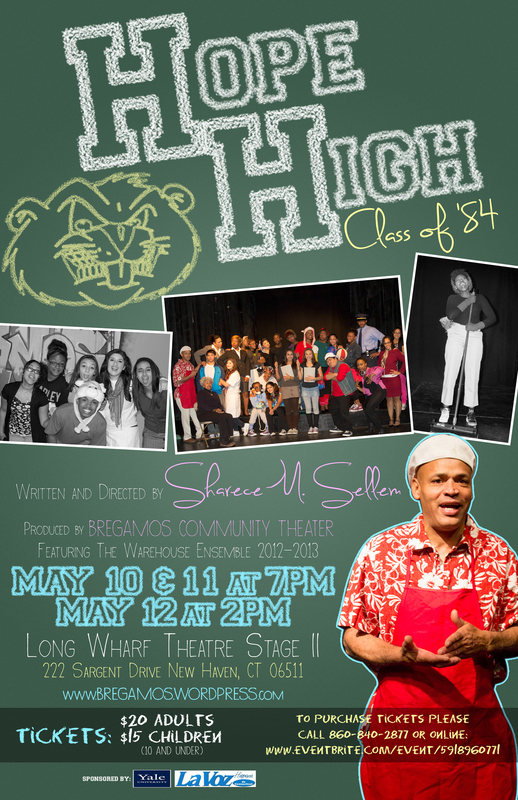 HOPE HIGH, Class of 84′ Music Video! “Patti,” Cedar City High’s only student council member, “Jeffery,” the dumb jock, and “Sistah Koffee Cobra,” the inspiration of the Leaders of The Sun group are maniacs! 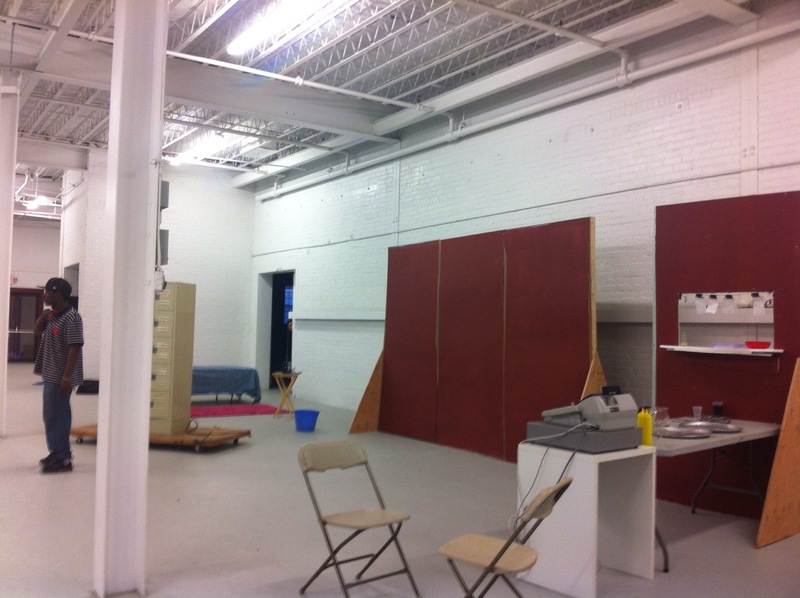 With just two and a half weeks until showtime, The Warehouse Ensemble is trucking along! We’ve found a home in a different warehouse to finish out our rehearsals. The space is huge and we get to practice all of our scenes just as we would if we were on Long Wharf’s stage! It’s big, bright and airy (sometimes a little too airy!) and we’re glad to have our new temporary home! Another bonus of such a large space is that we can simultaneously work on building the set. In the back of the warehouse, David Sepulveda paints away for the different backgrounds of our set. The park, Jaqi’s bedroom and Kang’s Diner come together more and more each day. On the other side of that room, we filmed a music video starring “Patti” the bubbly and sole member of Cedar City High School’s Student Council. We’ll have that video up for you soon! The Director is an artist…can’t you tell? We’ve been working really diligently for the past 6 months. The WE members have been great, never complaining and dutifully coming to two rehearsals a week. So we decided to blow off some steam by doing some in character bowling at Circle Lanes in East Haven last week while the teens were on spring break from school. We incorporated games like Taboo (where the kids had to mime or describe a character or other element of the play without using certain key words) and a game where the characters had to gossip about another character without using their names. The kids had a ton of fun and it was great to have them all hang out with each other on a more personal level. It was a true team building experience for everyone. 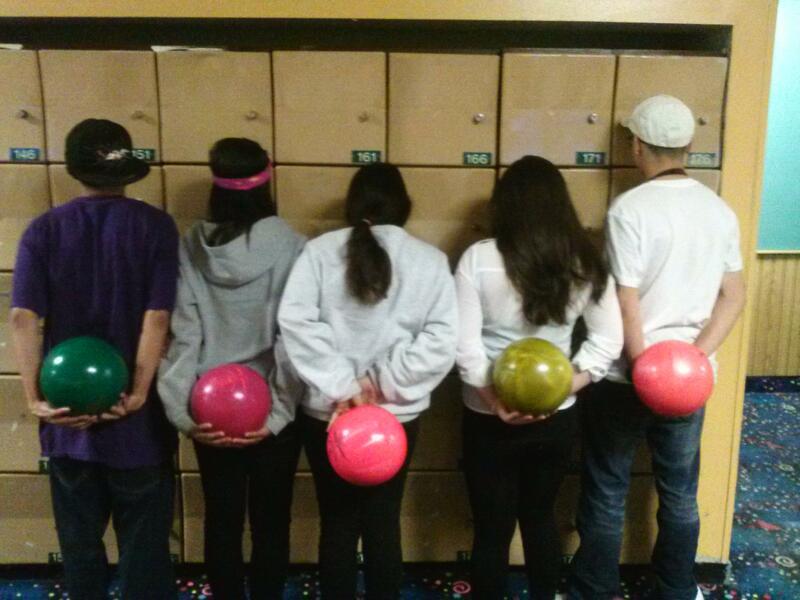 And they got to flex their bowling muscles too! If you haven’t bought your tickets yet, what are you waiting for? Adult tickets are $20, $15 for children 10 and under. You can purchase by credit card on our Eventbrite page, located here: http://hopehigh2013-es2005.eventbrite.com/?rank=2 or call (203) 303-7300 or e-mail warehousebct@gmail.com to purchase tickets in person.